This mechanism was completely disassembled and then cleaned, first in naphtha, then with an ammonia-based solution. Each part was then inspected, all pivots and pivot holes restored, and every part hand polished. Every screw was then cleaned of any rust and all the screws, along with the hands and the gongs, were re-blued. These two pages show the mechanism gears after the piece had been cleaned. 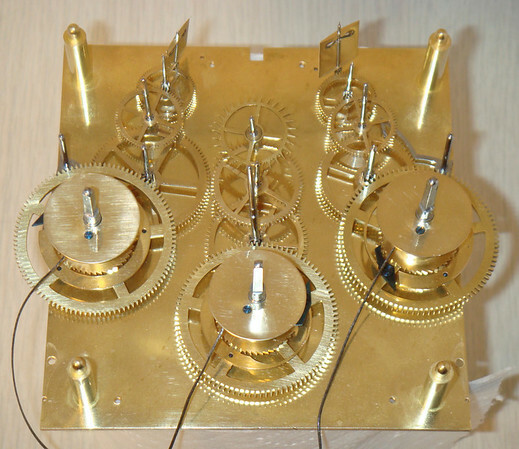 While the general layout and design is typical for a Viennese piece, I was amazed at how fine the pivots were - with the fan pivots measuring just ten thousandths of an inch - reflecting the true mastery of the clocks maker.